Who says doing good for others can’t be fun? 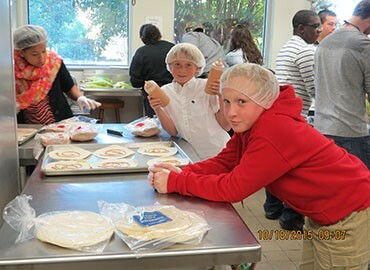 Along with other members, the youth of Maple Springs UMC help pack 100 lunches every week for H.O.P.E. to take to other youth in need. Since 54% of the local school students qualify for the federal free/reduced lunch program, that means there are 40,000 children who might be in need of a good weekend meal. Maple Springs has been a major supporter of H.O.P.E. from the first, and continues to help in many ways to ensure that we can continue to feed 1,000 children every Sunday, making it a day of HOPE instead of hunger. We are grateful for the compassion of the Maple Springs members!